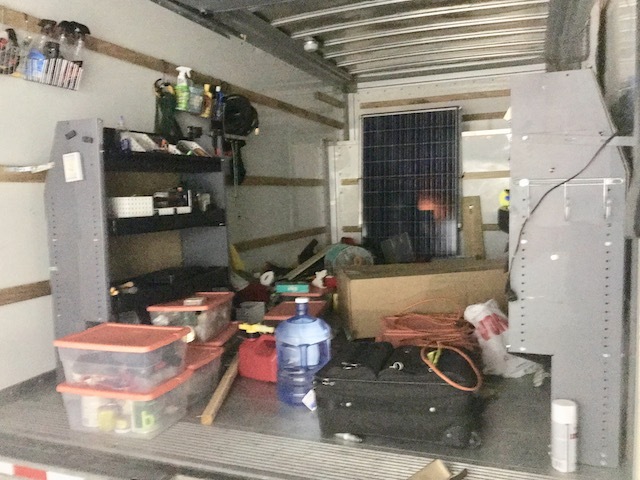 A 17-foot U-Haul Box Van has an inside floor dimension of 14'-3" long. The 10-foot U-Haul Box Van that we are driving now has an inside floor dimension of 9'-11" long. This means that by moving up to the 17-footer, we increase our length by 4'-4" over a 10-footer [Is my arithmetic correct?]. I am heading out toward the City of Riverside to check out a U-Haul 17-foot Box Van that is for sale! With the help of Mark, U-Haul's sales manager, we moved all the stuff from the rented 10-foot box van to our own Box Van. The first thing to do was to attach the  shelf-cabinets that came with the dear departed Señor Tránsito, to Box Van's wood runners. That attaching took me about 2-hours for both shelf-cabinets. After that was finished, there was now a place to put every single thing that we have! I spent about an hour picking up stuff from the floor and putting it away. Then, it was time to break for supper. I drove Box Van who towed Scampy, to Denny's. That's where I am now. It is as very cautious experience driving Box Van. He's long! 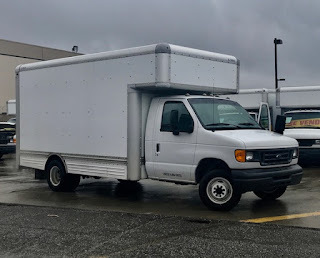 Bumper to bumper, Box Van is 23'-11" long! And add to that Scampy's 13-feet, that totals 36'-11". When were you last in Riverside? My wife and last drove thru in 2012, but we were returning from a trip and didn't stay (we did in Laguna Beach). When I got out of the Air Force in 1987, I stayed in San Bernardino and met my wife, got married in 1990, then moved to the Pacific Northwest in 1992 where we've lived ever since. My memories though were when I was growing up in the Riverside International Raceway era. You found what you wanted! Enjoy the build. Hi George, does the 17 footer you're looking at have the "attic " above drivers cab ? I seen one today in my travels and that attic would be excellent for storage . Sorry, I do not know anything about attics in trucks. George, the 'over-hang' above the driver area is the attic. They are referring to the part of the box that extends over the cab. That is called Grandma's Attic of the Attic. May the force be with you George! How about today's happy beginning? Can U-haul put a door and window in for you? I like your box truck...doesn't look like a van. No, U-Haul is in the rental business. I have a lot to do before I get to a door and a window. Building my living quarters inside Box Van are the #1 priority. George, wasn't the dear departed Ms. Tioga also 36 feet? MsTioga was 27-feet long, bumper to bumper. Hi George. in the picture it doesn't appear to have the pass thru from driver's cab into the cargo box. this pass thru is a major point. without it you'll have to exit the cab and re enter thru rear roll up door everytime you want to enter your quarters. thats going to me a major PITA. there are plenty of trucks with the pass thru available, I would strongly urge you to find one . why go thru all that when you can buy one already set up with pass thru. its a major effort to modify the cab.